Very often people ask me what the name tenkara means. When someone familiar with Japanese reads the name in Roman characters (tenkara), and not in the katakana characters (テンカラ), they read it as if it meant “from heaven”. The sound ten normally means “heaven or sky”, kara means “from”. However, use of the katakana system of writing gives an indication that it may mean something else. How the name originated, nobody knows for sure. However, I do know how it became popular and what it currently means. Tenkara was not always “tenkara” everywhere in Japan. Before it was widely known as “tenkara” throughout Japan, this method of mountain stream fishing was most commonly known as “kebari tsuri”. You see, “tsuri” is the Japanese word for fishing. “Kebari” literally means “feathered/haired hook”, and is the word for an artificial fly. Japan has a lot of mountains, and valleys. These valleys can be relatively isolated by the high mountains around them, and thus different dialects and words exist. One important note, the general, non-fishing population of Japan does not know the term “tenkara”, and will look quizzically if you ask them about tenkara. In this case, using the term “kebari tsuri” may give them an idea that it is a method of fishing with a feathered hook. If someone asked the Tenkara Bum, "where does the fish think the fly came from?". He would say "from the sky". If the person asked him how he was catching so many fish, he would reply "tenkara". This fish saw the fly approaching from the sky. Dr. Ishigaki, my sensei, started getting interested in tenkara about 40 years ago. At that time there was almost no information written or available. He found one book that talked of mountain stream fishing, “kebari tsuri” and gave a few pointers on the method. As he started devoting his time to researching tenkara, he was put in touch with many of the tenkara masters of the day. Some called it tenkara, others kebari tsuri. Suddenly, and in large part because of the research he was doing, articles he wrote for different magazines, and an appearance at one of the largest TV shows in the country, there was a resurgence in interest for tenkara in Japan. Many of the tenkara masters of the time started getting connected. Soon the word of choice for describing the traditional Japanese method of mountain stream fly-fishing, became tenkara. In part because it was shorter, part because it sounded more traditional and, in large part to be more specific and distinguish it from other types of fishing that used a “feathered hook”. So, what does tenkara mean? Tenkara means the “traditional Japanese method of mountain stream fly-fishing where only a rod, line and fly are used”. 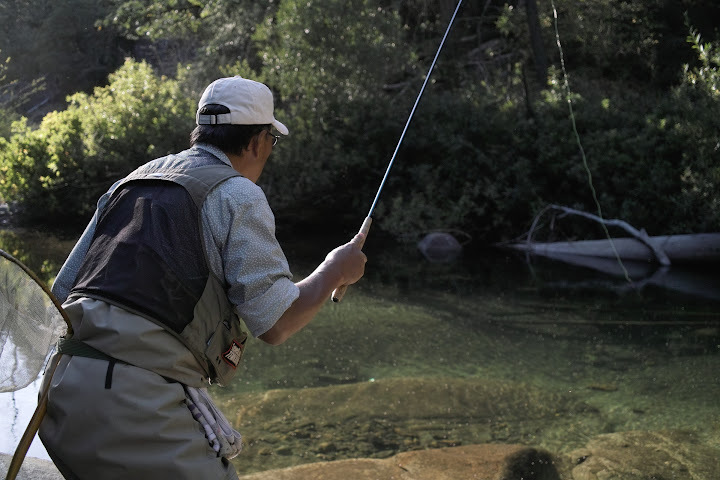 Tenkara is a very narrowly defined word used exclusively to describe this exact method of fishing where only a rod, line and fly are used to catch trout in mountain streams. I’m curious why Tenkara is written in Katakana and not Hiragana. Usually Katakana is used for foreign words. Does that imply that “Tenkara” may not have originated from a language other than Japanese? I think at some point in Japanese history, men wrote in Katakana while women wrote with Hiragana. Maybe that has something to do with it too? There can be a long chapter written specifically on this. There is not an official explanation for exactly why katakana is used. Mostly it is because no one knows where the word comes from and in such cases where the origin of a word is obscure, katakana is used. Katakana is also used for onomatopoeia (Japanese has hundreds of onomatopoeia for the most obscure things), and it’s possible tenkara could have been an onomatopeia for a fly being cast/landing or something similar. There is also one theory that tenkara may have been introduced from India (this is not really accepted, but some may think it came with Buddhism). It is also an unusual word in Japanese, and, as a way for Japanese people to read it as one specific word and distinguish it from the literal “from heaven” usage, which can be written in hiragana, katakana is used. There are a few other possible explanations. Hiragana is a later system of writing, while Kanji (Chinese characters) and Katakana were used in official documents back in the day. It’s interesting to note, also, that some Japanese personal names are written in Katakana, this was more common in the past. That’s a good response. I guess like many things in an ancient cultures such as Japan, things aren’t always “clear”, but the answers are always fascinating! As a keen fly-fisher with a love of Japan, I find this discussion fascinating. One question I have: is ‘kebari tsuri’ correct, or should it be ‘kebari no tsuri’, incorporating the possessive particle ‘no’? Hi Tom, good question. I never heard people saying “kebari no tsuri”, which sounds correct as well. I’ll have to inquire on why, but I wonder if the inclusion of a “no” may change the actual meaning of the term, so that all of a sudden it is not the equivalent of our compound nouns (fly-fishing), but something else.